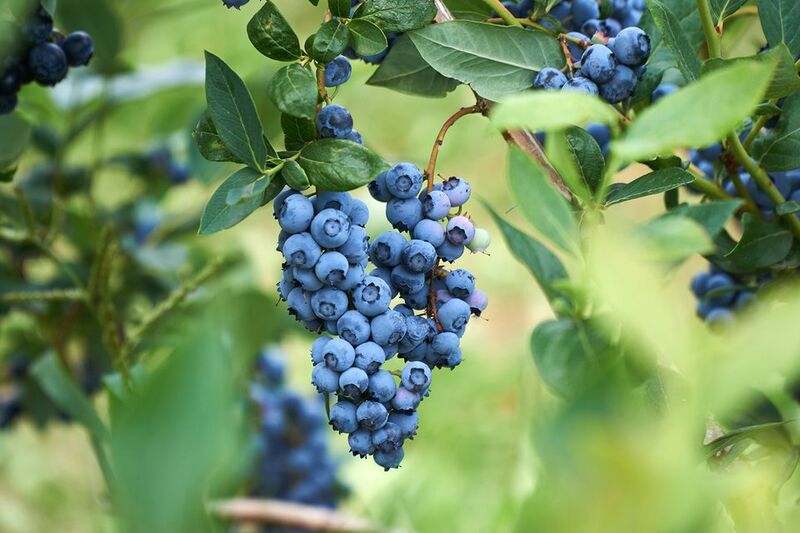 Blueberries are one of the easiest fruits to grow in your garden. They don't take up much space, can be grown in containers, and are quite attractive. Plus, you'll never have to overpay for a pint of flavorless blueberries at the supermarket again. In addition to being an excellent food plant, blueberry bushes are rather pretty. Their glossy, dark green leaves turn bright red in fall. Small white or pink flowers turn into white berries that turn a bit bluer, day by day. Add them to a shrub border, mixed bed, or pots on your porch or patio. Blueberries are hardy in zones two through eight. They are best grown in full sun for optimal fruiting, but will also tolerate partial shade. They grow well as part of a mixed shrub border, in a raised bed, or even in containers. Blueberries can be purchased as potted plants throughout the growing season. They are best planted in early spring or fall. Just plant your blueberry at the same depth it was growing in its original container. If you're planning on growing your blueberries in containers, then you'll want to choose a container that is at least 18 inches deep and can withstand outdoor winter conditions. Once blueberries are established, they're relatively easy to care for. If your soil isn't naturally acidic, you'll have to amend it regularly to maintain proper acidity. You can do this by merely topdressing the soil around the plants with any of the amendments mentioned above. Blueberries appreciate a feeding in early spring when the buds begin to burst, and another at fruit set. Fish emulsion or compost or manure tea all work well for this, applied as a foliar feed or directly to the soil. Aside from feeding and keeping the soil acidified, you'll want to weed around your plants regularly and make sure that they're getting at least an inch of water per week. Put mulch around your plants to retain soil moisture and keep weeds at bay. If you mulch with pine needles or coffee grounds, you'll do double-duty by adding acidity to your soil. Blueberries don't have many pest and disease problems. Rust, scale, and powdery mildew can sometimes be issues. More often, birds are the primary pest you'll be dealing with - they'll undoubtedly be after your berries! Luckily there are several things you can do to protect your berries from birds. Lowbush blueberries are low, bushy, spreading shrubs. They grow 4 to 24 inches tall and spread one to two feet. The fruit from these bushes ripens in mid-summer. These work well in the front of a border or edge of a garden bed. Lowbush blueberries are slightly more cold-tolerant than highbush blueberries.